Here’s something I’m pretty sure a bunch of you are waiting for, telco bundles for the upcoming Sony Xperia Z1. 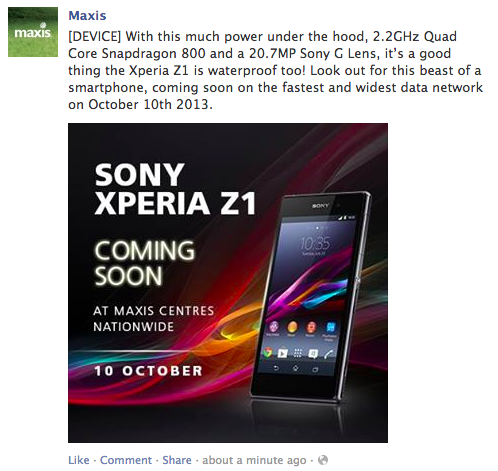 The device will officially hit our local shelves this Saturday, 4 October 2013 and it looks like Maxis will start offering it the next Thursday, 10 October 2013. The teaser was posted just minutes ago on Maxis’ very own Facebook page. We currently do not have any news about other telco’s offerings, but we certainly hope that they follow suit to announce something soon. Who here is looking forward to what Malaysian telcos have to offer for the Sony Xperia Z1?